Welcome to The First Baptist Church of Connellsville! Are you new to Connellsville? If not, we miss you if you haven’t attended for a time. How we thank God for His faithfulness to our First Baptist Church for over 216 years! We have experienced a long local history thanks to a handful of people who believed that God was able to raise up a Bible believing church which is a beacon to help lead this community. 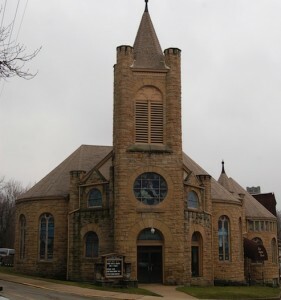 The First Baptist Church of Connellsville was organized on Sunday, June 26, 1796. First meeting in the homes of the charter members, in 1817 a one story brick building was built on the Southwest corner of Apple and Pittsburgh Streets, in 1877 the brick building was replaced with a two story building. In 1901 the building was sold to purchase the current property on the Southeast corner of Pittsburgh Street and Wills Road. Construction began and by 1903 the first baptisms took place in this stone Old English style building. Our beautiful stained glass windows depict various events in the Bible. Our congregation participates in Vacation Bible School, Annual Picnic, and Family Nights and other encouraging fellowship and holiday activities. Please continue to visit our site for updates on upcoming events! Copyright © First Baptist Church of Connellsville 2019.